With access to over 17,000 membership based organizations, I took the opportunity to interview some of our fastest growing customers. This is the story of one such association, which grew from 250 members in 2012 to over 1,000 in 2017. For many associations the annual conference is the biggest event of the year. But, what many associations don’t realize is that it can also be their biggest member recruiter. The Collegiate Information and Visitor Services Association, or CIVSA for short, is a great example of an association that uses its annual conference to add hundreds of members each year. CIVSA knows that the number one reason why people join associations is to network with others in their field. Since the annual conference showcases their network so well, CIVSA’s goal is to attract as many potential new members as possible and give them a chance to see the value of networking in action. Here is CIVSA’s four-part strategy for attracting new members to their annual conference and getting them to join. CIVSA found that the easiest way to get new people interested in their association was to bring the association to them. By changing locations every year, CIVSA gains exposure to new audiences and reaches people they may not have been able to otherwise. Just promoting the annual conference to people in new cities has done well to increase attendance year over year. The new location also keeps current members excited about attending, and allows CIVSA to learn the demographics of members in different areas to set up regional offices. All hands on deck means every board member is contributing in some way to promoting the annual conference. Even the annual conference’s brochure is written as one big advertisement for new attendees with a welcome message for them, a list of member benefits, and quotes from current members. With the effort of the entire board, CIVSA tackles many different areas of promotion to gain maximum exposure for its conference. Planning an event? Download our Ultimate Event Planning Checklist for associations and clubs. 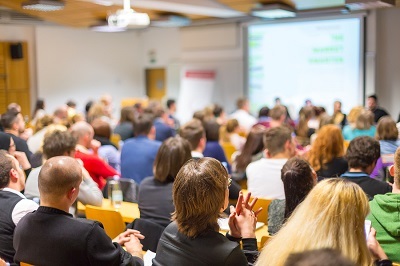 One of the easiest and most cost effective strategies that many associations are not doing is incentivising their members to promote the annual conference for them. For CIVSA, this is a critical part of their growth strategy. With hundreds of members all promoting the conference, CIVSA is able to reach far more people than what the board members could ever do on their own, plus that promotion is essentially free. To help enable their members, CIVSA gives their members two things. One is a physical flyer which can be distributed in person and the second is a social media share package, which they post to their social media channels. They also help to incentivise members to use these tools with some friendly competition. Any member who is able to get a new member to join gets entered in a drawing for a gift basket. While most people become interested in CIVSA through the annual conference, not all become members directly afterwards. And since the conference is only once a year, CIVSA looks for opportunities to create post-event engagement for its members and members-to-be. To find out the best way to engage its members, CIVSA conducts an annual survey, which has helped generate new ideas like smaller, regional events around the annual conference, book clubs and online webinars. It’s these post-event engagement activities that keep current members engaged and help convince potential members to join the association. Back in 2012, CIVSA only had 250 members. Once they began to use their annual conference as a promotional opportunity for their association, they began to grow by nearly 200 members every year since. Today, CIVSA has grown to over 1,000 members. And while CIVSA is one story of success, in our ten years of working with membership organizations, we’ve seen thousands of other formulas for success. Here are a few other inspiring stories. And of course, an extra special thank you to Jaime Rensel, previous CIVSA President, for taking the time to speak with me about CIVSA's member growth strategies. If you want to apply a strategy like CIVSA’s, without a proper event management system, you’ll quickly get bogged down by hours of manually processing registrations and payments, which can throw a wrench in the gears. In CIVSA’s case, as a Wild Apricot customer, they were able to use their membership management software to completely automate all event registrations and payments, allowing them to focus their time on planning and promoting the conference. Every year, Wild Apricot helps over 17,000 membership organizations plan over 230,000 events (processing over 5,000,000 registrants!). If you’ve got an event coming up, learn how Wild Apricot’s all-in-one membership management software can make it easier to run. And, be sure to download our free Ultimate Event Planning Checklist for associations and clubs. Four Things that Turned This Association’s Annual Conference into a Member Recruiting Machine. Love your content. This one was full of great tips that can be applied to user groups as well. With all of those events in your community, have you considered a partnership with Eventmobi?